Clear, reliable visual indication of water level, local to the tank, can be critical for operations personnel in the treatment, preparation and control of water at all stages of the boiler or steam generation process. Traditional sight glasses are difficult to read, particularly with age, and can be subject to glass breakage resulting in potential safety, leakage, lost production and maintenance issues. The solution is to install ABLE magnetic level gauges. 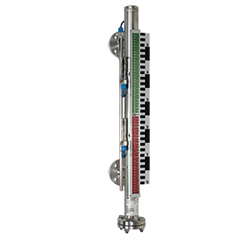 The ABLE magnetic level gauge is a bypass chamber, generally fabricated in stainless steel (although other metals and plastics are available), incorporating a float which contains an integral magnet. The buoyant float rises and falls with the liquid or interface level whilst the magnet causes coloured flaps to rotate or ‘flip’ within the visual indication rail mounted externally to the chamber. The silver and red indication flaps represent air and liquid or the interface level respectively, based on the position of the float. The level gauge chamber is a pressure containing vessel in it’s own right, flanged or screwed to the side or top of the tank. The level indication is magnetically coupled to the float as described above and as such no glass is needed to actually see the liquid level, removing the inherent weakness and safety concerns of traditional sight glass or reflex level gauges. – Clear, reliable, non-powered visual indication of water level local to the tank. – Designed for Condensate, LP and HP Heaters, De-aerators, Coalescer, Storage and Drains tanks and columns. – Directly replace difficult to read sight glasses, removing the potential of glass breakage leading to safety, leaking and maintenance issues. – Add switches or continuous level measurement outputs at installation or retrofit at a later date. In addition the magnetic field from the float magnet can be utilised by switches or a transmitter clamped to the outside of the chamber to provide single or multiple alarm points, for example at low or high level, or a continuous 4-20mA output of level to be transmitted back to a control system. As the additional output devices clamp to the outside of the chamber they can be installed at a later date if required. For more information regarding ABLE Magnetic Level Gauges, please click here.